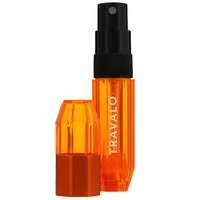 Home Brands Travalo Perfume Atomiser Milano Red 5ml / 0.17 fl.oz. Offering a level of luxury in the portable fragrance market, Travalo Milano features a more refined, sophisticated approach to patented Travalo technology. Featuring an elegant design of leatherette and polished metal, this sleek and functional atomiser makes the perfect travel home for your favourite fragrance. Travalo Perfume Atomiser Milano Red 5ml / 0.17 fl.oz.